if you live in los angeles, you probably know that beverly hills is a part of town where it’s hard to find vegan food. however the newsroom cafe on robertson is an extremely vegan-friendly eatery that’s often overlooked. they’ve a huge menu of healthy-style options, a full juice bar, hearty breakfasts, baked goods, desserts….even beer, wine and fresh-fruit-filled cocktails. i used to frequent the newsroom often a couple years ago, though i always found it a bit trendy and over-crowded with ‘celebrity’ clientele and health-nut yuppie types. fortunately and unfortunately, the place was smacked with a C rating from the health department a year ago, and business has slowed down a bit. while at first i was horrified about the low grade, i later found it was due to meat refrigeration temperatures and i talked myself into thinking, “fuckit, i’ll still eat there. serves those carnivores right! meat’s murder after all.” so now after a long break, i have finally returned to the newsroom, which is much emptier than i remember it, but the food is still bloody spectacular. today with my husband, i visited the newsroom after a very long break and i went with something i’d never ordered before—monja’s tofu scramble with no cheese. 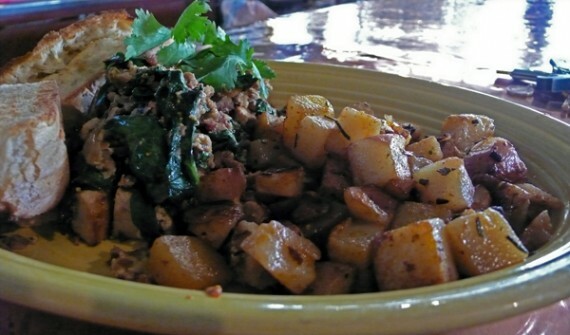 when my food arrived, the huge plate was loaded up with well-seasoned scramble, thick soy sausage bits, sauteed spinach, caramelized onions, and more crispy breakfast potatoes than i could ever eat. albeit a tad expensive, this dish was a serious food score…i highly recommend monja’s. plus, as a side it came with two ginormous slices of ciabatta bread that were so crispy i could barely eat them…in a good way. although it was a seemingly boring tofu scramble, monja’s managed to be a completely unique and refreshing take on vegan breakfast. here here. my husband stuck with the good ‘ole spicy tofu cancun, which i’ve blogged about before, but was every bit as excellent this time around. i used to eat the tofu cancun at the newsroom at least twice a week back in the day, and when i tried it this morning, it tasted better than ever. something about the steaming chunks of seasoned tofu all mixed in with softly cooked tortilla chips, then slathered in hot sauce…where can you go wrong? definitely give this thing a whirl; i’d say it’s up there with the best breakfasts in los angeles. so at the end of the day: i know i have condemned the newsroom for having a low health score before, but i cannot lie…their food is brilliant. go load up on a huge vegan breakfast with fresh juice and a few animal-free sides next time you get the chance. it will cost you, but it’s definitely worth it. and if you are looking for a cheaper alternative, hit up the sister-location interim cafe in santa monica…the menu is almost the same, except even more vegan friendly and less expensive. oh also, let’s take a moment to look at the silver lining. the newsroom used to be filled to the brim with total d-bags. now that they have had health department dramz, the place is mellow and much more enjoyable. since the issues were eventually about the meat storing systems, i think i can look at the dramz as their loss and my gain. let’s go enjoy the newsroom before it gets full of yuppie cuntz again. Mmm, both breakfasts look super tasty! Sounds great! 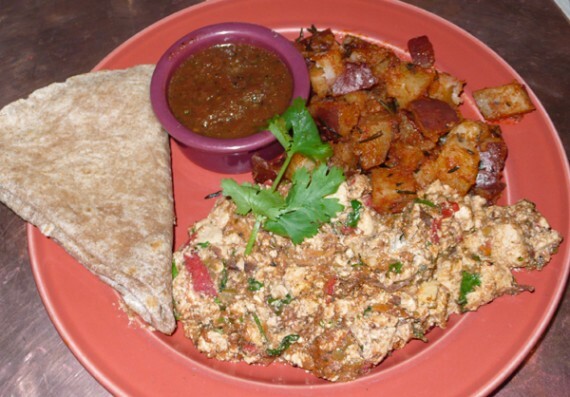 I wish we had more vegan breakfast options here in Phoenix. Its a fun place to eat with non vegans, too, especially friends visiting from out of town. I haven’t been to either location…yet. Food looks yummy! I’m going to have to disagree with you here. I had one of the worst dining experiences in ages at the newsroom. First off, the soup came out cold on a rainy day! We sent our bowls back and they came out warm. *I like my soup pipping hot. * The tamale was a joke. Our table was trying to figure out how a dish could have so many ingredients- yet no flavor. There was nothing inside the tamale, the plate was just corn masa with some peas and tomatoes on top. The faux drumstick dish was the most overpriced thing i have ever ordered. The cornbread it came with was burnt and dry- totally inedible. 16 bux for 4 little drumsticks, nasty mashed potatoes, and burnt cornbread. Insulting! If you like the fake drumsticks, you can get a whole huge bag of the same ones they use at the thai market on hollywood blvd for the price of this dish. I almost forgot to mention the 12 DOLLAR quesadilla!!! The service was terrible. I have eaten there every so often throughout the years and just now realized what scam it is. A real easy way to waste 100 dollars. Un frigging believeable.